Congratulations to Séwé Sport for winning their first ever title in the Ivorian Ligue 1. The exciting team from San Pedro in southwestern Ivory Coast also had the highest scorer in the league in petit striker Koelly Kevin Zougoula (born 20.03.1984). Zougoula scored three goals during the Ligue 1 (12 matches) and another seven goals during the Superdivision L1 (10 matches). Zougoula was also top scorer last season with 11 goals. It is fair to say that the pacy striker is the most consistent goalscorer in the Ivory Coast. The picture is of Zougoula (orange shirt) and was found on news.daylife.com. 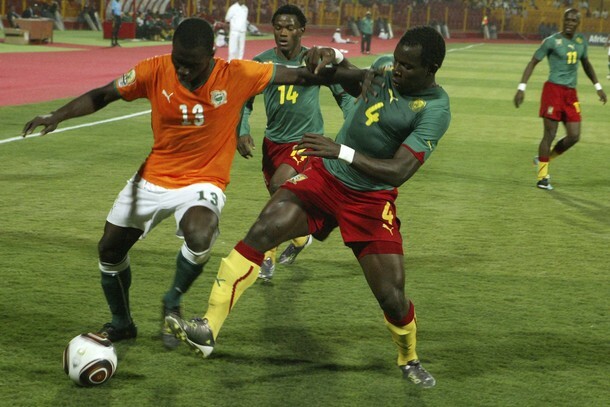 The other player is Cameroonian defender Gustave Moundi of Union de Douala.